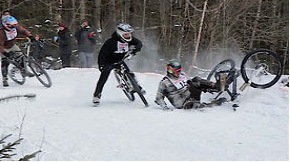 A collision of several bikers on an icy curve in the race course! Dozens of mountain bikers, some with “fat tire” equipped bikes race down an icy trail near Burke Mountain, Vermont. Winterbike, as it is called, offers spectators plenty of action. There are plenty of wipe outs and “air time.” This annual event held in early March ends a winter that has not been too cooperative with winter sports.